The name says it all - why wait for hours to marinate your ceviche when you can use this quick poaching method to pre-cook the shrimp in minutes. Toss with our Italian dressing and fresh citrus juices for the perfect refreshing summer flavour. Substitute your favourite fresh seafood, such as scallops, clams, crab and/or chunks of white fish, for some or all of the shrimp. Ceviche makes a great appetizer to bring to a summer party or barbecue. Simply double or triple the ingredient amounts and serve over crisp crackers or tortilla chips. 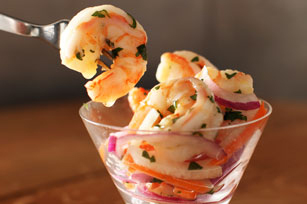 Thanks to the shrimp, this fast appetizer provides an excellent source of protein per serving.